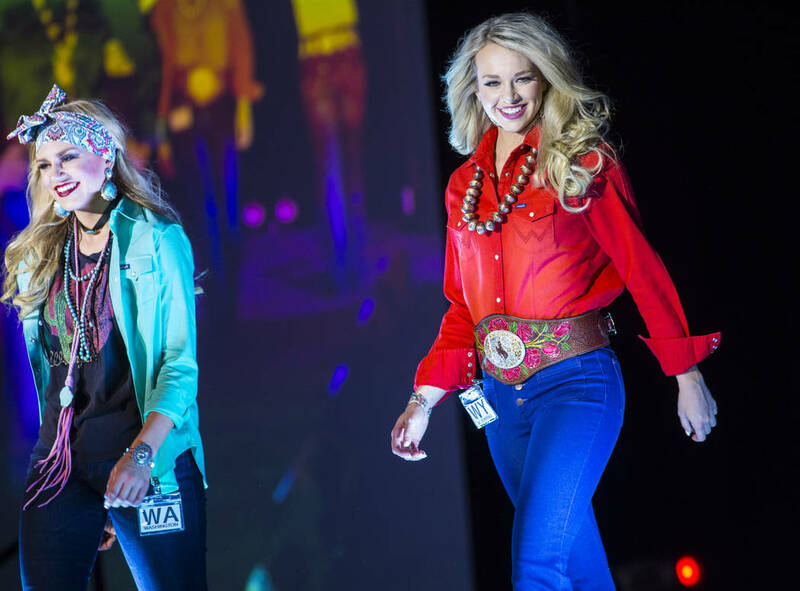 Twenty-eight contestants from across the country are in Las Vegas to compete to be crowned 2019 Miss Rodeo America. The hardest parts were behind them: the displays of horsemanship, the personality interviews, the speeches. 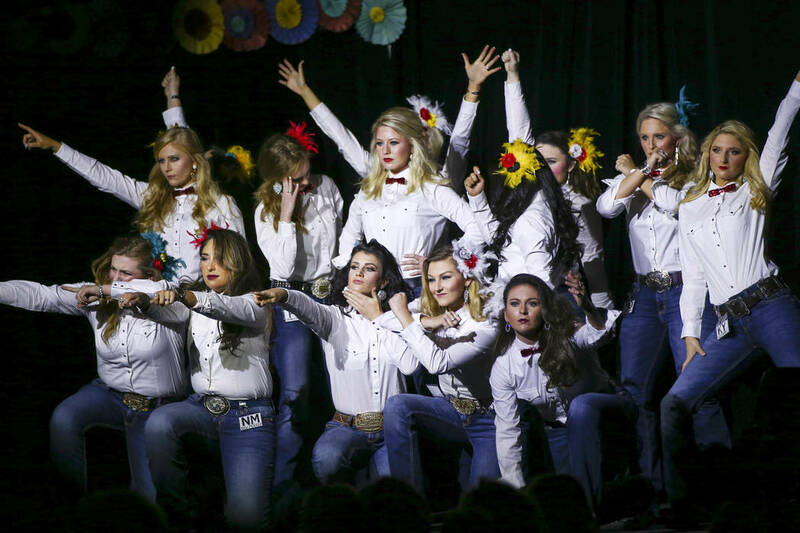 On the sixth day of the eight-day process, the contestants for Miss Rodeo America 2019 took part in a fashion show Friday, one of the final events as the pageant moved closer to coronation day. 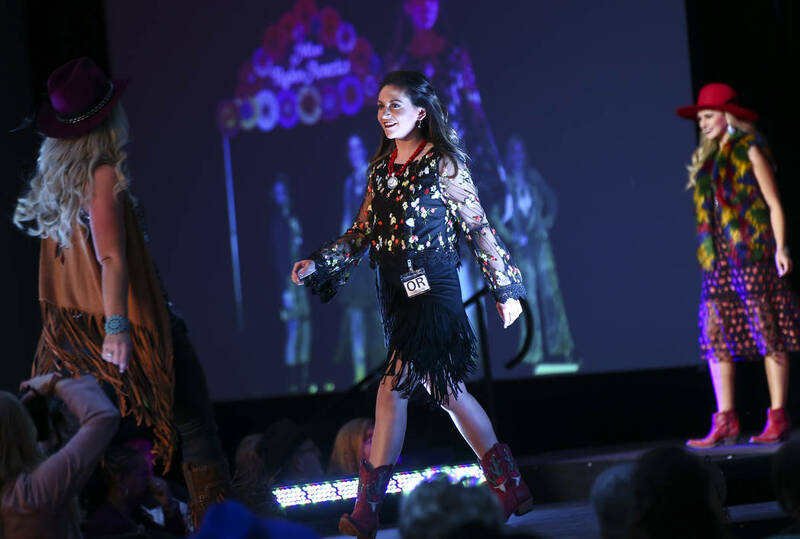 They modeled a range of Western wear, including fringe, fur and bedazzled jackets. 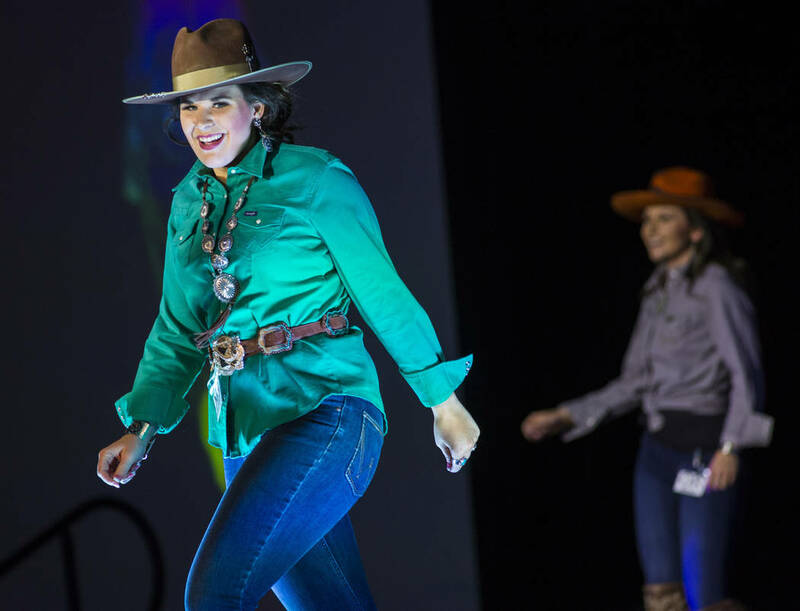 Each of the 28 contestants has much to offer, but they share some common denominators, said Miss Rodeo America President Kiki Shumway of Pasco, Washington. One of the contestants will be named the 65th Miss Rodeo America during a 10:30 a.m. ceremony Sunday at the Tropicana. The pageant, held in the days leading up to the Wrangler National Finals Rodeo, awards nearly $100,000 in scholarship money to the winner and top finalists. Shumway said she is impressed by the camaraderie of the contestants. 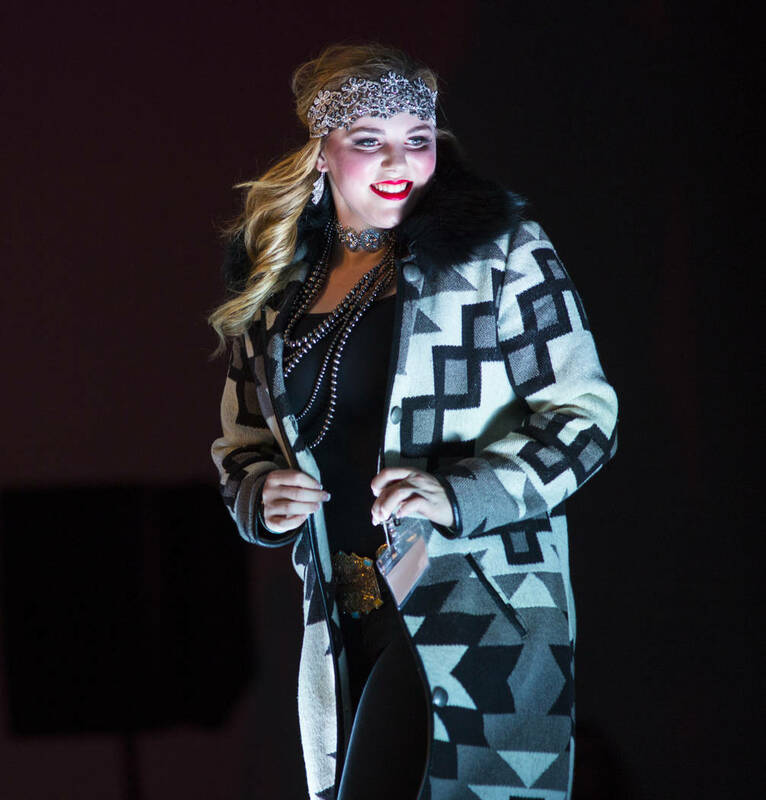 Before the fashion show, Miss Rodeo Alaska secured a red sequined bow tie around her neck and blue feathers in her hair. Days before the pageant, Ariel Hunt had all her items packed at her home before when a 7.2 earthquake hit near her hometown of Anchorage. Her family is safe, she said, but many items in their home were destroyed, including a special scrapbook each contestant makes to document her time at the pageant and as Miss Rodeo in her home state. “This is a great learning experience. Here I can learn things about myself I didn’t know before,” she said before rushing to finish her makeup. Jenna Kool, Miss Rodeo Iowa, was also backstage before the show, perfecting her opening outfit. She said her platform if selected for the top honor would be to serve America to the best of her ability. As the fashion show started, the contestants held glowing lights above their heads and danced in formation. 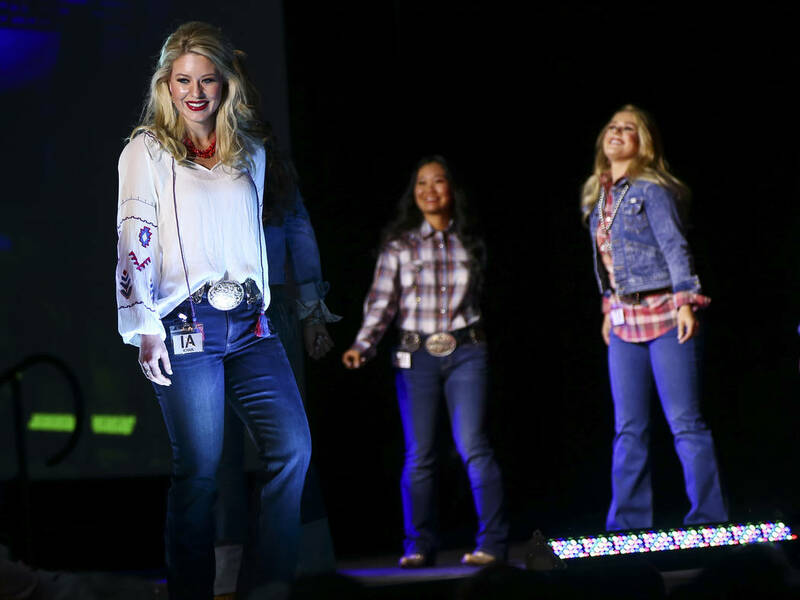 When they modeled, they strutted down the runway in cowboy hats, danced in denim and high-fived one another. The woman crowned as Miss Rodeo America promotes the Professional Rodeo Cowboys Association, Western heritage and the agriculture industry. She also serves as a liaison between rodeo fans and professional rodeo producers, sponsors and contestants, as well as an ambassador to young rodeo fans. This year, 150 volunteers helped put on the show. New Mexico resident Dona Rutherford has volunteered since 2003. To her, it’s a passion. Former winners from the 1960s still return each year, and many are chaperoning the contestants this year. 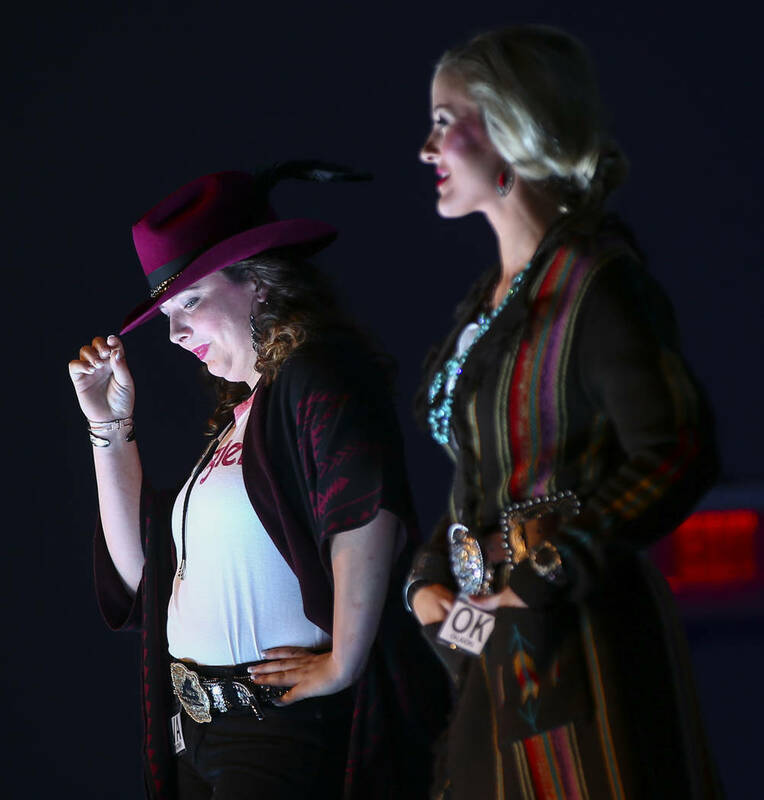 Before the title is passed along to the next Miss Rodeo America, the current holder delivers words of encouragement and reflection in a farewell letter printed in the pageant’s program. Miss Rodeo America Keri Sheffield recalled spending the last year traveling more than 120,000 miles across the U.S. and beyond to Canada and Australia. The Floridian remembered her mom packing her bags for competitions, her dad shining her boots, her brother hand-painting his boots to match her outfit and her sister proofreading her essays and posts. Contact Briana Erickson at berickson@reviewjournal.com or 702-387-5244. Follow @brianarerick on Twitter.